10 ORTELIUS, A. Africae Tabula Nova. ( Anvers, 1574) Col. Left and right hand margin underlaid for protective reasons. Two holes in lower part map filled in. 372 x 495 mm. � The title is contained in a striking cartouche consisting of a panel flanked by caryatids and strapwork. The sea is engraved in stipple-work, and features a sea-battle in the lower right corner, as well as swordfish and a sea monster. 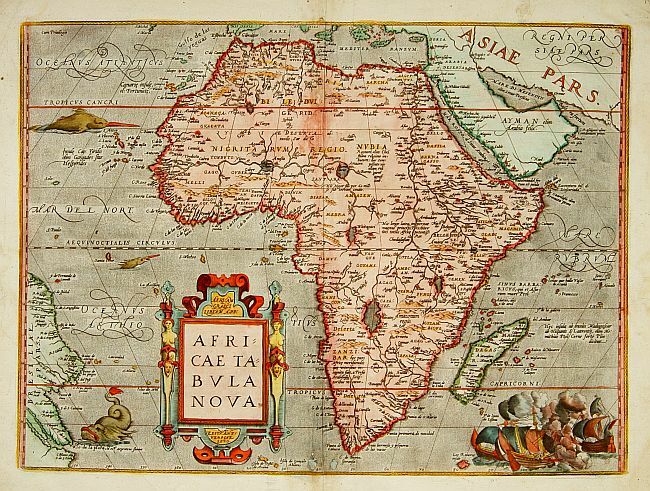 Ortelius' depiction of Africa is based on Gastaldi's rare wall map of 1564, though with modifications such as the more pointed southern tip of the continent. The Ptolemaic notion of two lakes in central Africa as the source of the Nile is maintained. Dated 1570. No sign of crack in the copper plate visible. - Van den Broecke, Ortelius atlas maps, 8. 11 MERCATOR, G. / HONDIUS, J. Nova Africae Tabula. ( Amsterdam, ca. 1630) Beau col. ancien. - Paper browned, as usual, split in lower part center fold repaired, not affecting engraved area. Contemp. colour. Framed. 373 x 501 mm. An attractive map of the continent, added by Hondius when he took over the publication of Mercator's Atlas. Although it is based on Mercator's map, Hondius improved the outline of Madagascar, and named Cape False and Saldanha Bay. Richly ornamented map of the continent. Decorative title cartouche surrounded by a wreath and topped with an animal head. There are five ships under full sail. - Norwich's Maps of Africa, 27. 12 NOLIN,J.B./ TILLEMONT, Nicolas du Trallage. L'Afrique selon les Relations les plus Nouvelles� ( Paris, 1704) Limites en col. d'�poque. Sous rhodo�d. - Paper slightly age-toned as usual, split along center fold, a few tears and splits upper part (5 cm into engraved area), margins and center fold reinforced. 455 x 595 mm. 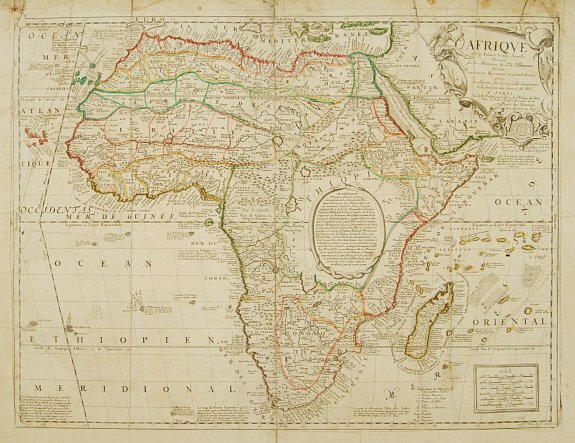 � Attractive map of Africa, dated 1704, referring to Sr. de Tillemont and J.B. Nolin. Except for the name in the cartouche, it is really identical to one originally published by Vincenzo Coronelli in 1689. Tillemont, who corrected and amended the map, was Coronelli's collaborator in Paris and J.B. Nolin was their publisher. Nolin must have published this map separately on several occasions as it is not regularly found in atlas form. Engraved by H. van Loon. Rare. - Norwich's Maps of Africa, Map 85. 13 DELISLE, G . / BUACHE, Ph. / DEZAUCHE, J. Carte d'Afrique Dress�e pour l'instruction... ( Paris, 1819) Limites en col. d'�poque. Bel exemplaire. 490 x 630 mm. � Porte la mention : Garantie Nationale, An 1819. D'apr�s la carte de Delisle de 1722. - The title cartouche is changed, a cockade replaces the Royal arms of France, and all references to the King are removed. 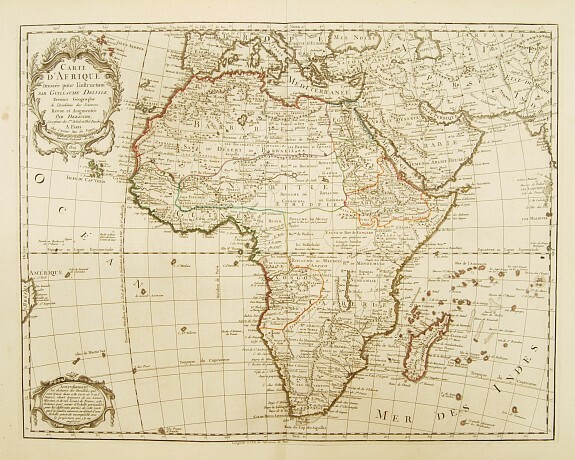 - Tooley, Maps of the African Continent� p. 71, �tat non d�crit. 14 MARIETTE, P. / SANSON, N. Partie de la Coste de Barbarie en Africque.. ( Paris, 1655) Limites en col. ancien. Infimes rousseurs. 370 x 533 mm. 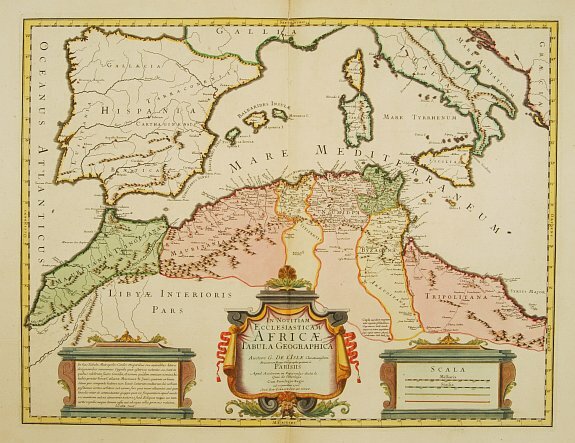 � Decorative map of the northern part of Africa with Tunisia and Libya, including Malta. Engraved by Joannes Somer. A first state with address: "A Paris chez Pierre Mariette en la Rue St. Jacques a l'enseigne de l'Esperance. Avec Privilege du Roy pour vingt Ans." 15 L'ISLE, G. de. In notitiam Africae Tabula Geographica� ( Paris, 1700) Beau col. - A good and dark impression. In very good condition. Printed on heavy paper. 480 x 609 mm. � This is a typically fine map of northern Africa by Guillaume de l'Isle, here with the address "Sur le Quay d'Horloge", dated 1700. The west coast of North America is delineated up to Cape Mendocin and Cape Blanc. Part of Europe and Africa shown. Decorative cartouches. 16 MONTANUS, A. / DAPPER, O. De Stadt Algier. La Ville d'Alger. / De Stadt Gigeri. La Ville de Gegery. / La Rache. ( Amsterdam, ca. 1668) Traces de pliure. 230 x 325 mm. Vue panoramique d'Alger avec flottille � l'avant-plan. L�gende en fran�ais et en n�erlandais : A-L. Joint : Vue panoramique de Gegery avec flottille � l'avant-plan. L�gende en fran�ais et en n�erlandais : A-K / Joint : Vue panoramique de La Rache. (3 pl.). 17 BRAUN, G. / HOGENBERG, F. Tunes Oppidum. ( Cologne, 1575) Col. ancien. Papier l�g�rement jauni. Fente le long du pli central. - Paper slightly age-toned, split along lower part center fold, caused by oxidation of green colour. 115 x 460 mm. 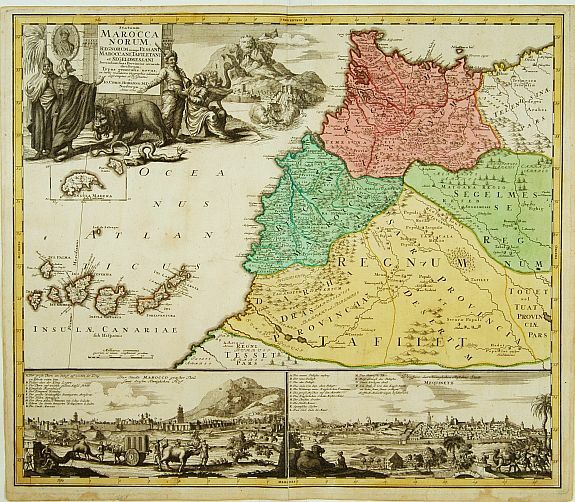 � This panoramic view of Tunis is the upper part of an original three-engravings in one sheet. From the greatest publication in this genre. The "Civitates" was compiled and written by George Braun, Canon of Cologne Cathedral. Braun gathered together vast amounts of information and draft plans to produce over 500 city views/maps published in six parts between 1572 and 1617. 18 BLAEU, G. Fezzae et Marocchi Regna Africae celeberrima� ( Amsterdam, 1635) Col. Marges un peu jaunies, infimes rousseurs. 380 x 500 mm. An attractive map of northwest Africa and Morocco. The Pillars of Hercules & Straits of Gibraltar, and Spain are shown to the right of the map (north is to the right of the map). Blaeu credits Ortelius and his 1570 map as the source of data for this map. Spain controlled portions of this area from 1580 until 1640 along the coast at Ceuta, Tangier, and Arzilla. A sea battle is shown in the Atlantic ocean. 19 MONTANUS, A. / DAPPER, O. Arzylla of Argille. / Fezz� et Marocchi Regna Afric� Celeberrima. / Salee / Tanger. / Le palais et une partie de la ville de Maroc. ( Amsterdam, ca. 1668) Traces de pliure. Plance "Le palais et une partie�", pli droit consolid� sue 16cm. 230 x 325 mm. 20 HOMANN H�ritiers. Statuum Maroccanorum regnorum nempe Fessani� ( Nuremberg, 1728) Col. ancien. Rousseurs. Belle impression. - Paper slightly age-toned, a few brown spots. Split in lower part center fold, 6 cm into the engraved area, expertly repaired. A good and dark impression. 480 x 562 mm. � An attractive map of Morocco, including insets of Morocco (Marrakech) and Mequinetz (Meknes). Highly decorative figured cartouche top left. Also shows the Canary Islands in some detail and another inset of Madera. 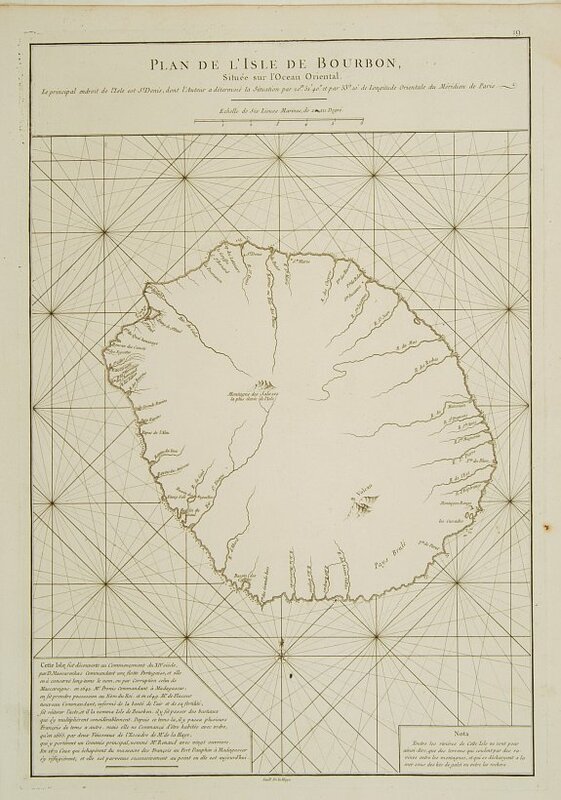 21 L'ISLE, G. de. Carte de la Barbarie de la Nigritie et de la Guin�e. ( Paris, 1707) Limites en col. ancien. - In good condition. 489 x 613 mm. 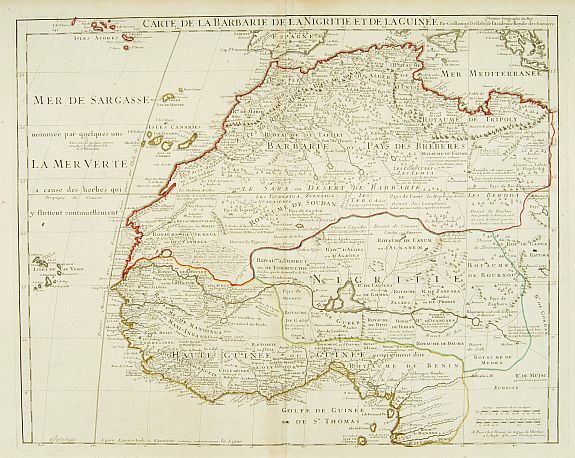 � A detailed engraved map of north west Africa including the Canary and Cape Verde Islands. In this map De L'Isle corrects his previous impression of the Senegal river, which he used to join to the Nile by a hypothetical line in earlier maps. He now records the Niger as "an arm of the Nile". Engraved by Inselin. Address and date changed, remains of old address still visible. The title is displayed along the top of the map. Guillaume de L'Isle (1675-1726), French cartographer, pupil of Cassini, called father of modern geography was member of the Academy of Sciences 1702 and "Premier G�ographe de Roy 1718". He produced over 100 maps and atlases. 22 CORONELLI, V. M. Isola di Madagascar, o di S. Lorenzo scoperta da Portoghesi nell'anno 1506. ( Venise, ca. 1690) Bel exemplaire. 600 x 450 mm. � Decorative and highly detailed map of Madagascar, including 2 decorative cartouches. 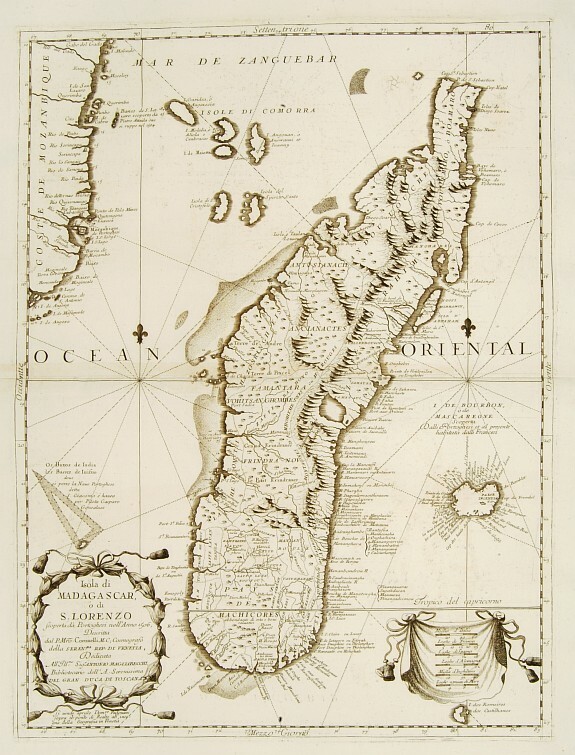 Coronelli's map of Madagascar is one of the most decorative and sought after of all maps of the island. 23 D'APRES DE MANNEVILLETTE. Plan de l'Ile de Bourbon, Situ�e dans l'Oc�an Oriental. ( Paris, 1775) Col. Good impression, printed on heavy paper. Some light marginal water staining. 490 x 330 mm. � Carte de l'�le de La R�union publi�e dans le "Neptune Oriental". - French chart of the Isle of Bourbon. Prepared by M. L'Abb� de La Caille. Latitude and longitude scales, compass rose and system of rhumb lines, soundings near coast and in bay areas. D' Apr�s de Mannevillette (1707-1780) was a famous French sailor and hydrograph. During a voyage to China in 1728 he succeeded in correcting the latitudes of many places using new instruments. Back in France he devised a plan to correct and publish all the existing maps of the route to China: the Red Sea, the coasts of India, Malaya, the northern parts of Indonesia, Indochina and China. When the first edition of his Atlas Le Neptune Oriental (containing only 22 charts) was published in 1745, it was regarded as a major achievement and library indispensable to navigators. In 1672, d'Apr�s was appointed director of an office established by the Compagnie des Indes for the publication of charts.